Passed away peacefully at St. Luke’s Place on Sunday, April 21, 2019 at the age of 78. Lovingly remembered by her son Michael Krupp and her grandson Anthony. Marilyn was predeceased by her husband of 36 years, Wilfred Krupp, and her sister June Craig (Don). She was daughter of the Late Clare and Marion Pettit. In lieu of flowers, donations to the Alzheimer Society of Canada would be appreciated. Our beloved father and friend passed away peacefully on April 20th 2019 at the age of 86 years. Predeceased by his wife Linda Formhals (2016). He is survived by his son Alex Formhals, daughter Laura Formhals (Iain), Step-daughter Jennifer Robertson (Mark), Step-son Michael West (Sandy). Dear brother to Lilian Evans (Roy). Grandfather to Bramwell Robertson and Jaccob and Kassandra West, Kevin, Sean and Krystal Formhals. Fondly remembered by his extended family and friends. 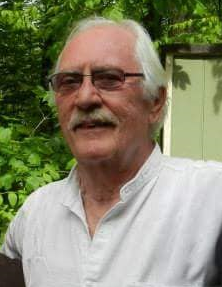 As per David’s wishes there is to be no formal memorial service and his 4 children will be scattering his ashes at the base of Muskoka River later this year. In lieu of flowers, memorial donations may be made directly to the Canadian Cancer Society or Rett UK and would be appreciated by the family. Messages and condolences can be left for family at tricitycremations.com or 519.772.1237. “Let us all raise a parting glass to Dad and remember how he lived life to the fullest." Please visit David's obituary notice on Facebook. Passed away peacefully at Lisaard House on April 16, 2019 in his 63rd year. Ellig (Donna) and he was Uncle to four nephews and one niece. Predeceased by his father Jack Ellig (1998). Special thank you to all of Randy’s caregivers over the past two years. Cremation has taken place. A private family gathering has also taken place. In lieu of flowers donations may be made directly to Lisaard House and would be greatly appreciated. Messages and condolences can be left for the family at tricitycremations.com or 519.772.1237. ​Please visit Randy's obituary notice on Facebook. On Saturday April 13, 2019, Len quietly passed away surrounded by his family at the age of 82 years. Len was born on August 21st , 1936 in Toronto. He was an Engineer with the City of Toronto for over 25 years. Followed by a number of consulting positions to finally retire at the age of 80 with 57 years as a Professional Engineer. Loving father of Lorraine, Michael and Michelle. Also survived by their mother, Jan Rach. Proud Grandfather of Derek, Yasmin, Lyam and great grandfather of Luella and Robert. He will be sadly missed by many family and friends, especially by Sandra Hill. Predeceased by his parents Serge and Anna Rachuboff. Cremation has taken place. A celebration of Life will be held on Sunday May 5th from 1 - 3pm in Toronto. Space is limited, for directions please contact Michelle at michellelaura601@gmail.com to receive more details. In lieu of flowers, donations may be made directly to Jumpstart for Kids and would be greatly appreciated by the family as Len was an avid supporter and participant of sports. Messages and condolences may be left for the family at tricitycremations.com or 519.772.1237. ​Please visit Len's obituary notice on Facebook. The love of my life passed away peacefully on Saturday, April 13, 2019 at Morriston Park Nursing Home. She was 79 years young. Predeceased by too many family and friends – Parents, three brothers, three sisters, many in-laws, her son Peter (1996) and her daughter Julie (1962). She will be missed by family, nieces, nephews, great nieces and nephews and great, great nieces and nephews in the U.K. and U.S. Also my brother David, his wife Trish and Trish’s family in the U.K. Not forgetting her sister Mary and family in New York. Cremation has taken place, so in lieu of flowers, please donate to your charity of choice. My special thanks to all the care givers who looked after Jeannie, especially those Angels at Morriston Park Nursing Home for the loving care she received during her time there. And after 60 years together, I will miss her most of all. ​All my love – Arthur. Please visit Jean's obituary notice on Facebook.